DVD and Blu-ray are two most popular forms of modern home movie enjoyment. DVD and Blu-ray each has their own advantages and disadvantages so different people have their own preferences. Blu Ray can provide better quality than DVD and DVD is more compatible than Blu Ray. However, sometimes we need to convert DVD and Blu Ray to each other, For example, if We only have a DVD player but we have needs to play a Blu Ray disc, then here comes the problem, because DVD players cannot play Blu Ray discs. So how do we solve this problem? is there a way for us to convert Blu Ray to DVD? or can we burn Blu Ray to a DVD disc? today we’re going to find out together, because next I will introduce a way to burn Blu Ray to a DVD disc easily. To burn Blu-ray to DVD, the first thing you need to do is to rip your Blu-ray disc to a digital video file so that you can burn it to a DVD disc. In order to do that, we need some Blu-ray ripping software. Here I recommend you try Leawo Blu-ray Ripper. As professional Blu-ray ripping software, Leawo Blu-ray Ripper can rip Blu-ray discs, ISO files or Blu-ray folders to digital video files like and MP4, WMV, MKV and so many more with the original quality retained. Now I will show you how exactly to rip up Blu-ray disc to a digital video file. Step 1: download and install Leawo Blu-ray Ripper. 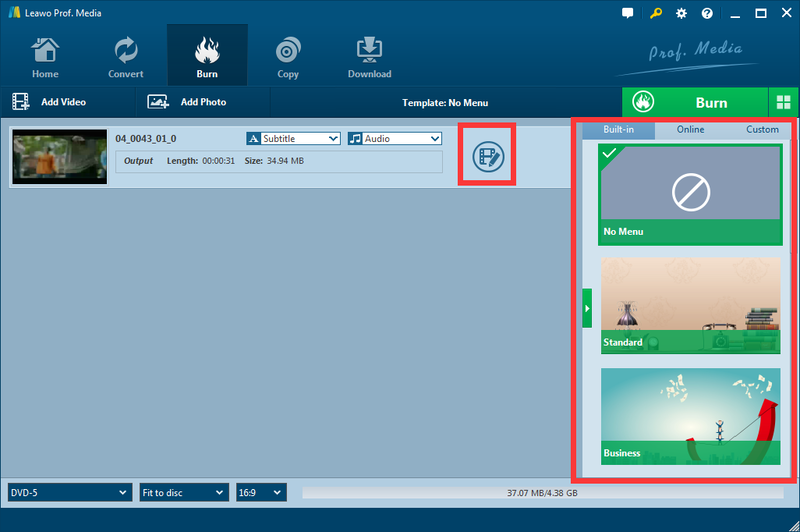 Step 2: Import your Blu-ray folder or ISO file by clicking the add Blu-Ray/DVD button. If you are about to rip a Blu-ray disc, you have to insert the disc first, and then click on “Add from CD-ROM” button. Step 3. Click on the Video format button beside the green “Convert” button to change the output video format. It’s suggested that you choose MP4 or AVI has the output format because they are very compatible and stable comparing to other formats. Step 4. Then you can edit your video by clicking the “edit” button or you can directly rip your Blu-ray as the way it is. The edit you can do to your video includes cropping, trimming, adding watermarks and even adding 3D effects. Step 5. 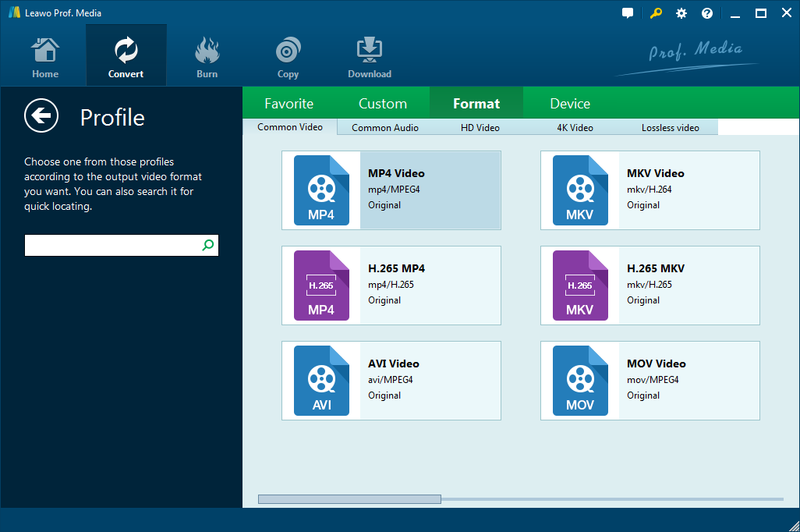 After you have done all the edit you want to do to your video, you can click on the green “convert” button to start ripping your Blu-ray to a digital video file. Now that you have ripped your Blu-ray disc to a digital video file, the next thing you need to do is to burn the video file to your DVD disc. The program you need to use in this step should be a good DVD burning program. Now I recommend you try Leawo DVD Creator. As a professional DVD burning program, Leawo DVD Creator can burn digital video files in any format to a DVD disc, ISO file or a DVD folder. Of course, also with the original quality retained. 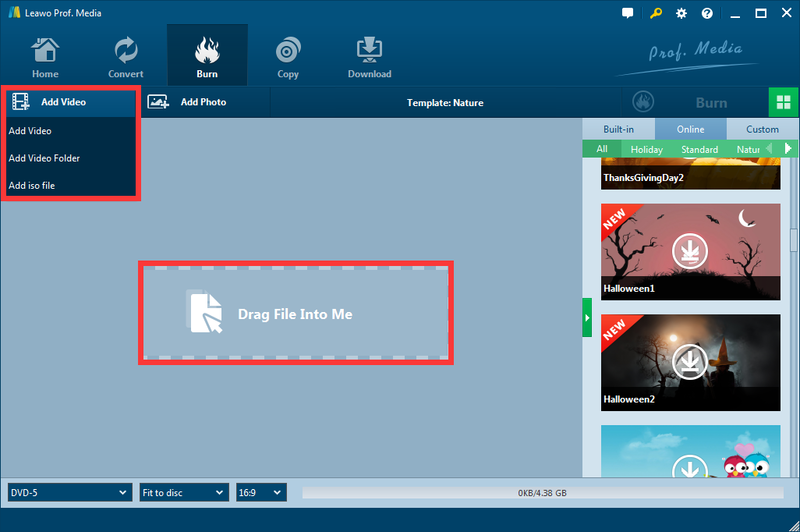 Now let me show you how to burn our Blu-ray to DVD disc with Leawo DVD creator easily. Step 1. download and install Leawo DVD Creator, then insert a blank DVD disc into your DVD drive. Step 2. 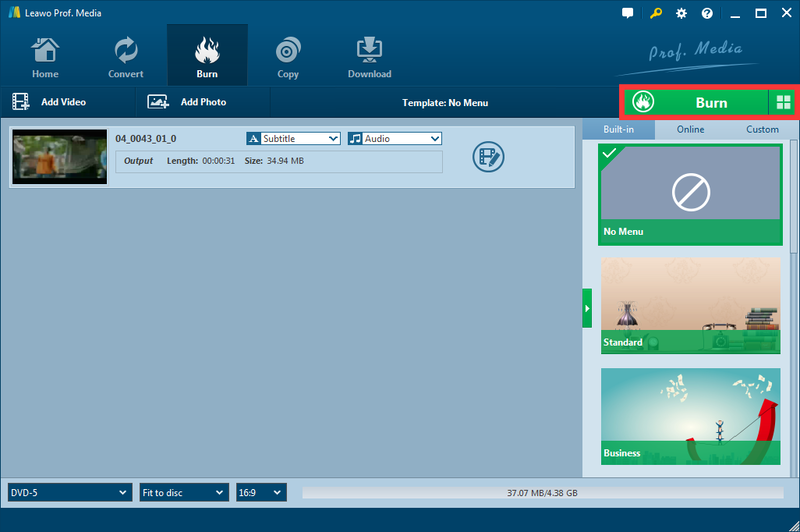 Import your video file by clicking the add video button or directly drag your file into the frame in the center of the interface of the program. 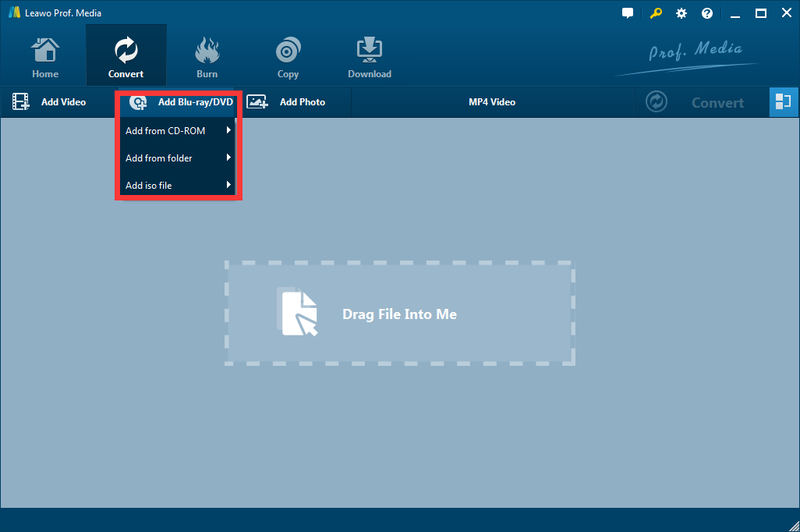 Step 3. you can also edit your video just like you did in Leawo Blu-ray Ripper. Also, you can design a DVD menu for your DVD base on the built-in menu template or online template. The menu template section is on the right of the interface. Step 4.After you have done editing your video or designing your DVD menu, you can click on the green “Burn” button to call out the burning settings panel. Set an output directory and then click on the burn icon below to start the burning process. The burning process should be finished in a short while. At this point, you have successfully burned your Blu-ray to a DVD disc. The final step is to test whether your DVD disc can properly be played. You don’t actually have to insert your disc to a DVD player to test it, because there’s another way that is easier to test your disc. You can download Leawo Blu-ray player on your computer and directly play your DVD with it. Leawo Blu-ray Player is a powerful free media player that can play all forms of DVD or Blu-ray materials as well as all forms of digital video files. In the playing process, Leawo Blu-ray Player can retain the original quality of your video so that you can have the best experience with both visual and sound effects. Leawo Blu-ray player is considered one of the best alternatives to Windows Media Player, but better. Because Windows Media Player cannot play DVD and Blu-ray materials, and without extra codec packs, the video formats Windows Media Player can play is very limited. Download and install Leawo Blu-ray player, insert your burned DVD disc to your computer, launch Leawo Blu-ray player and click on the button tagged with the name of your CD drive, and then your DVD disc should be successfully be played in Leawo Blu-ray Player. After addressing the question of how to format DVD-RW in Windows 7, more and more movie fans will be keen on better burning result in a fast speed. Thus we come to the Leawo DVD Creator. As a top-of-the-class DVD burner software app, it supports more than 180 formats. The video to 3D DVD creation function enables you to enjoy stereo DVD video. Abundant DVD menu templates and menu design features helps you get customized DVD discs. The best part? Of course, the Leawo DVD Creator can preserve the quality of the original video while burning the video to DVD and ensures that the DVD playback would look just as good as the original video.